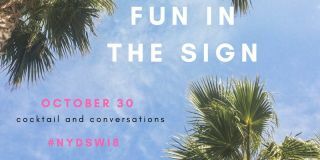 Women of Digital Signage is joining forces with the AVIXA Women's Council NYC Metro Group and the AVIXA Diversity Council to host a networking event—Fun in the Sign—on Oct. 30 during New York Digital Signage Week (NYDSW) 2018. "We're proud to continue our tradition of working together with other groups to provide a networking forum for women in the AV industry," said Gina Sansivero, VP of marketing and corporate communications, AtlasIED and co-founder of the AVIXA Women's NYC Metro Group. "This tropical-themed event gives us all one last chance to celebrate sunshine before the chilly New York winter begins." "NYDSW is always an exciting, and busy, time for the digital signage industry," said Andrea Varrone, show director, DSE and co-founder of Women of Digital Signage. "Our event will provide an opportunity for digital signage professionals to reconnect with current partners and create new—and hopefully fruitful—relationships." The event will be held on Oct. 30 from 5-8 p.m. at the Unilumens Showroom. The event is sponsored by Unilumens, New Era Technologies, FSR, Sapphire Marketing, Chief, Peerless AV, and Brightsign.